Is It Good? Alien vs. Predator: Fire and Stone #4 Review – AiPT! The fourth and final issue of Alien vs. Predator: Fire and Stone is here. Will a clear cut winner emerge in this interspecies slugfest? Alien vs. Predator: Fire and Stone #4 goes down a lot like the three issues before it: Blood of sundry colors goes a flyin’. Mutant versions and non-mutant versions of the titular characters get to scrappin’. Elden rattles off the same bombastic equivalents of “Are you my friend? Why are you doing this,” “I don’t want to fight,” and “Fine, I’ll show you savage brutes what pain is,” in sequence and then godmodes his way through his battles without any hint of drama or suspense. Wait… what? Is this even an Alien vs. Predator comic? I imagine they’re attacking you because you won’t shut the hell up, Elden. Not really. Come issue’s end, writer Christopher Sebela makes it pretty clear that our beloved titular extraterrestials are second fiddles to the Elden and Francis: Fire and Stone show. And that’s disappointing because Elden is nowhere near as interesting as Sebela intended; in fact, he’s probably the least interesting character in the story (despite having the most spoken lines). The concept of Elden, a synthetic infected by and drastically altered by the enigmatic black Engineer ooze is ostensibly cool, but downright baffling (robotic components replaced by “improved” living tissue? Huh? ), especially because there is little to no explanation as to how or even why. Elden claims to have improved understanding of everything as a result of his metamorphosis, but nothing that comes out of his mouth in four issues implies such. In Elden’s defense, he still looks pretty cool — like a four-armed version of Lord Zedd sans helmet — so I guess he’s got that going for him. So it’s clear I don’t think Elden gels well with the Alien/Predator mythos. If that had been the only problem with the series, Alien vs. 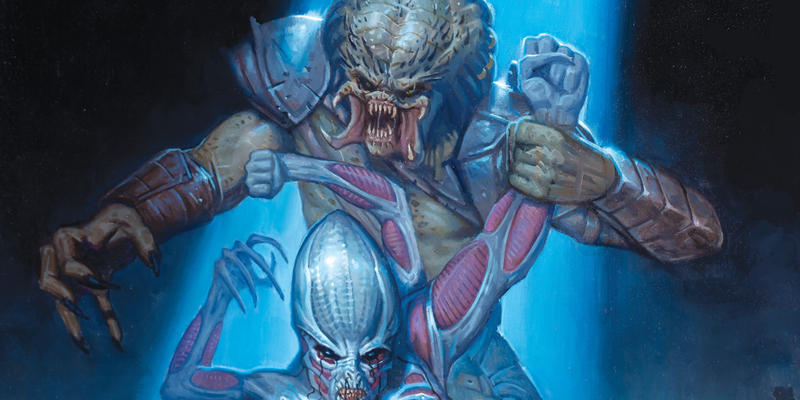 Predator: Fire and Stone #4 might have been salvaged by the fact that at least Elden’s interactions with the Xenomorph and Yautja could have been somewhat compelling. But they’re not. That’s a problem even more glaring: the underwhelming character exchanges; the fact that a masterfully constructed game of cat and mouse from issue #1 and a showdown with potential for amazing character exploration deteriorated into nothing more than Toxic Avenger looking mutants kicking and biting each other and Elden spouting nonsensical rhetoric. Besides a contrived scene where a Predator “bloods” Elden and another where Elden makes a rudimentary remark about an Alien’s physiology/mindset, there wouldn’t have been much difference in the narrative if Sebela had substituted the Aliens and Predators for a bunch of random hostile aliens and that’s a shame. We learn nothing new about the Aliens and nothing new about the Predators, nor do we get even a scintilla of insight into how they might perceive Elden to differentiate the series from previous AvP offerings. And things started off so well. Ultimately, the Alien vs. Predator: Fire and Stone amounts to a lot of spectacle and very little in the way of interesting story. The narrative banks way too hard on the character of Elden, who I expect will be a very polarizing figure in the mythos, and doesn’t pay proper reverence to the Aliens or Predators. If you’re a fan of the respective universes, give the series a look-over, but don’t expect anything that contributes much to the established mythos.